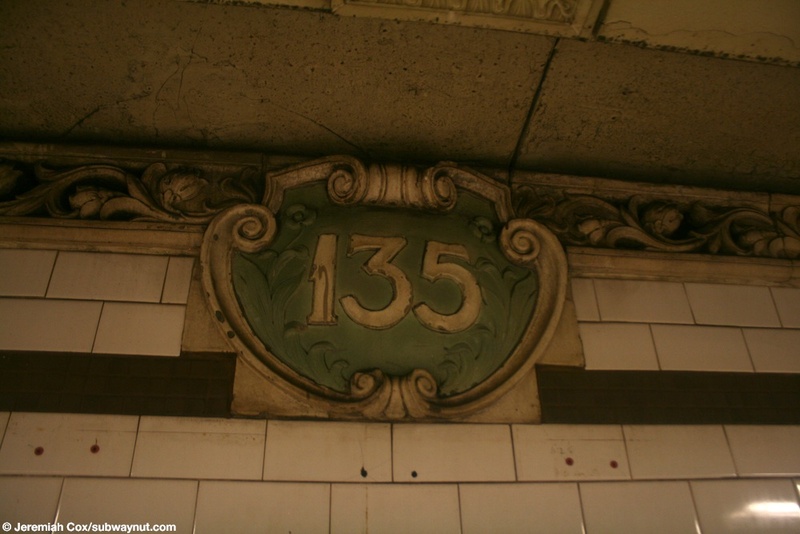 135 Street is a Lenox Avenue station and where the 2 and 3 meet for their long haul together to Brooklyn. 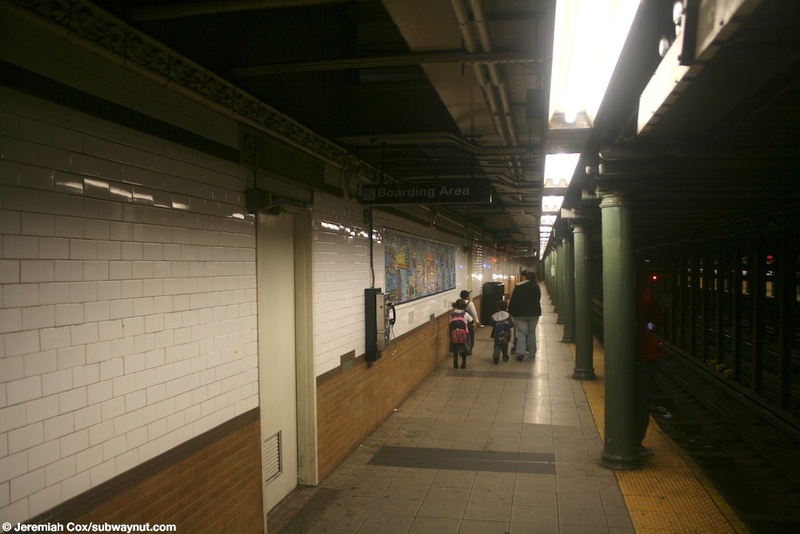 The station has two platforms and three tracks, the middle track used most recently for Late Night 3 shuttle trains until they were replaced with buses in 1998. 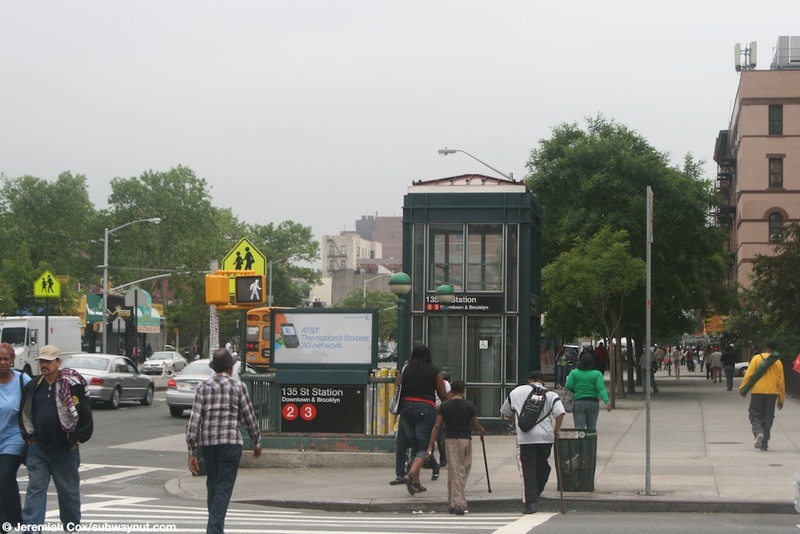 The station has two side platforms with no crossover/under, which is a bit of a problem because passengers wishing to transfer between trains from the Bronx and the 3 to 148 Street must go all the way down to 110 Street the first station with a free directional transfer. 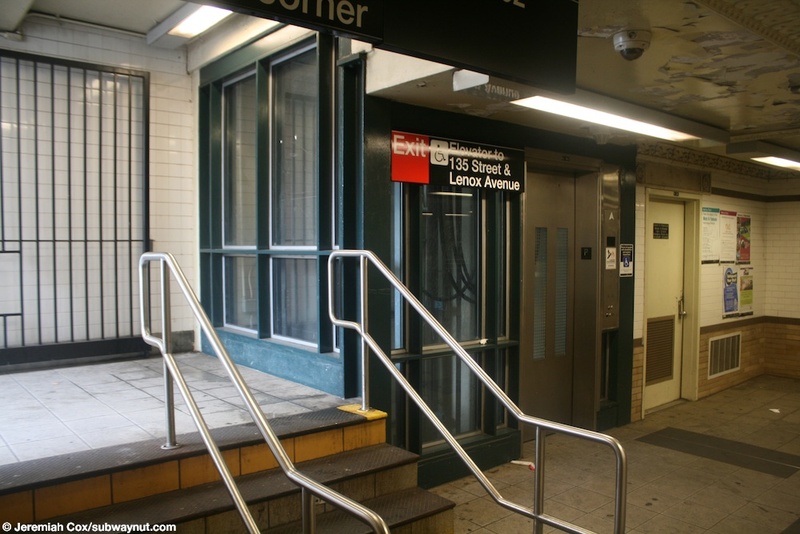 The station has one entrance in each direction (with two staircases to the street each) and was recently renovated with an elevator added. 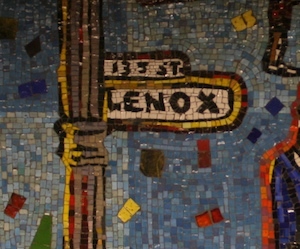 An interesting aspect of the station is that there are 3 different types of repersentations in the stations trim and molding, (original terra cotta cartouches, a mosaic representation of this and modern 135 lettering), and two different types of name tablets (original mosaics and one with a modern font and design that only exist here and it the sister stations along Lenox Avenue at 125th, and 116 Streets). 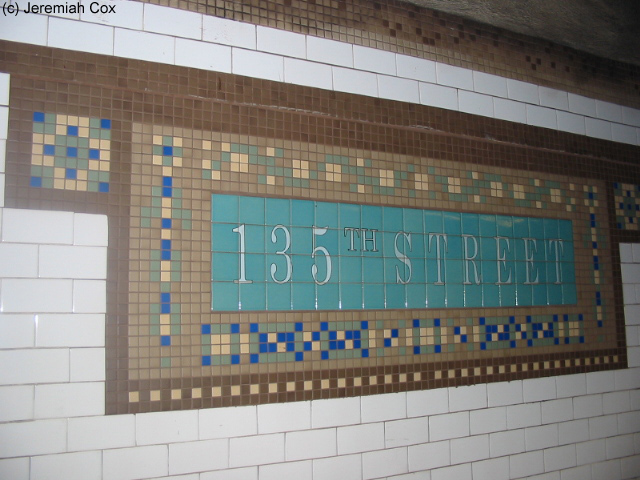 (135n21) A flat mosaic representation of the terra cotta cartouches at 135 Street. 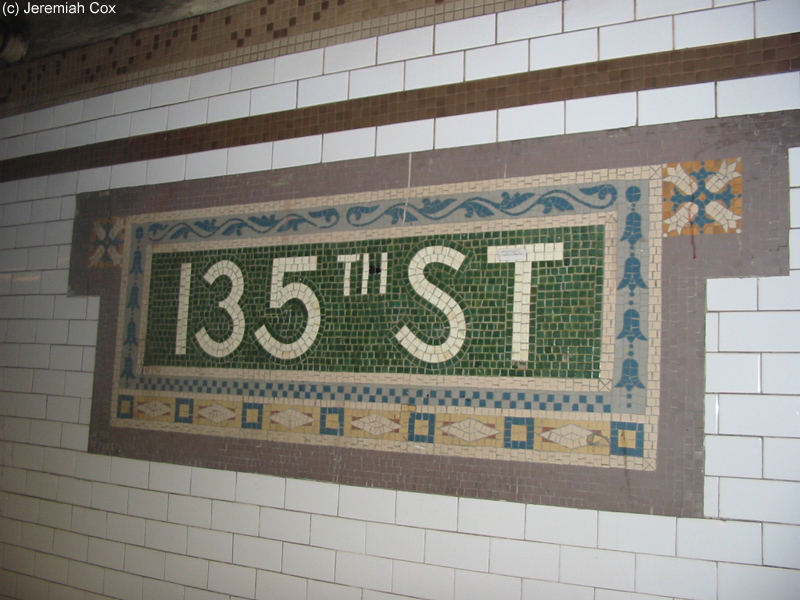 4 April, 2004 (135n22) A Heins and LaForge era mosaic name tablet at 135 Street. 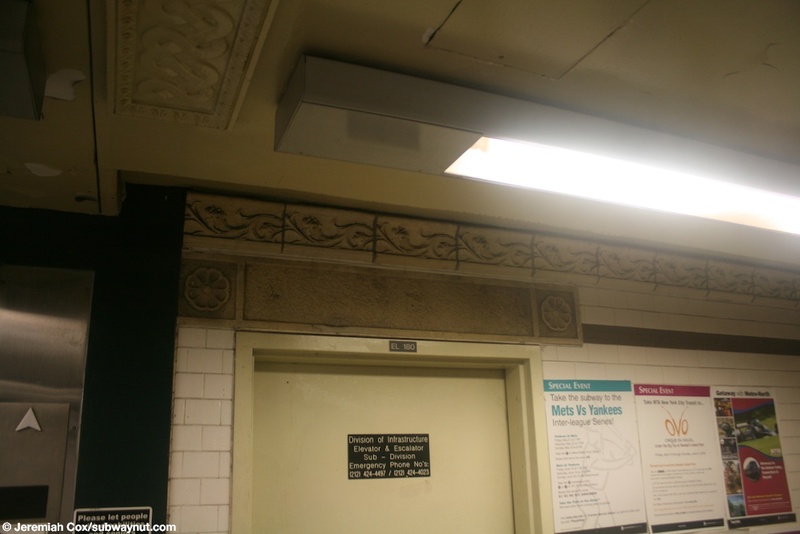 4 April, 2004 (135n24) A 1904 terra cotta cartouche with 135 in it at 135 Street. 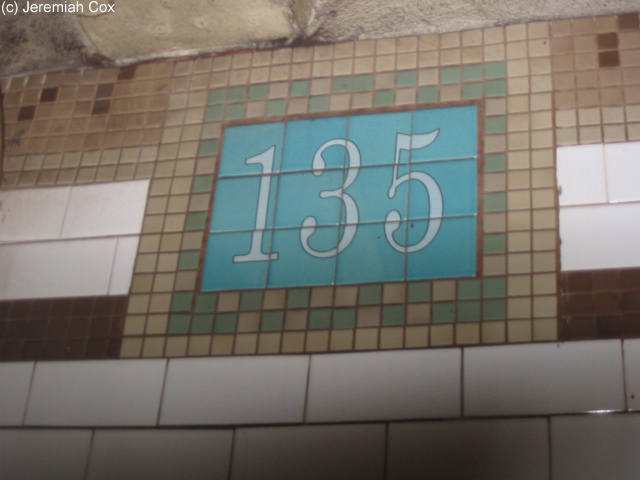 (135n25) A modern tyring to look retro name tablet at 135 Street. 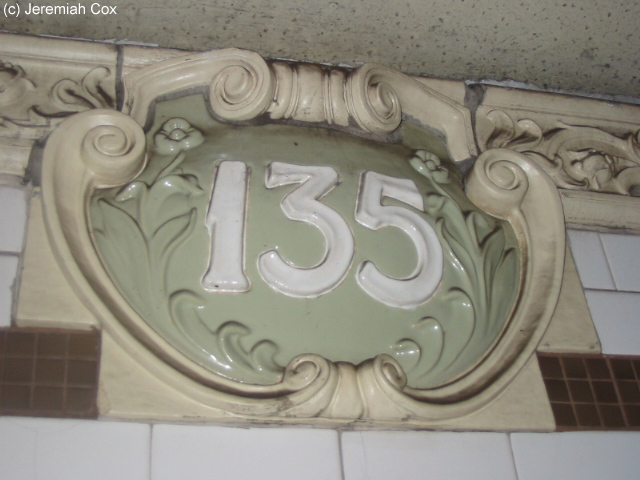 4 April, 2004 (135n26) A close up of a 1904 terra cotta cartouche with 135 in it at 135 Street. 24 May, 2010 (135n27) The uptown fare control area, approaching the NE street stair and elevator. 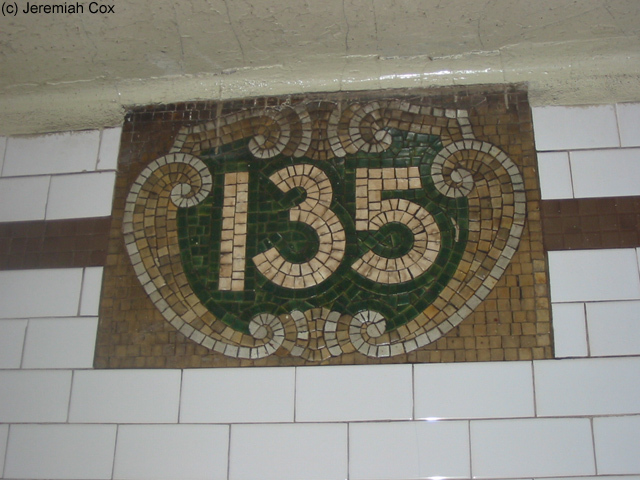 (135n29) Another close-up of the lower landing of the elevator at 135 Street. 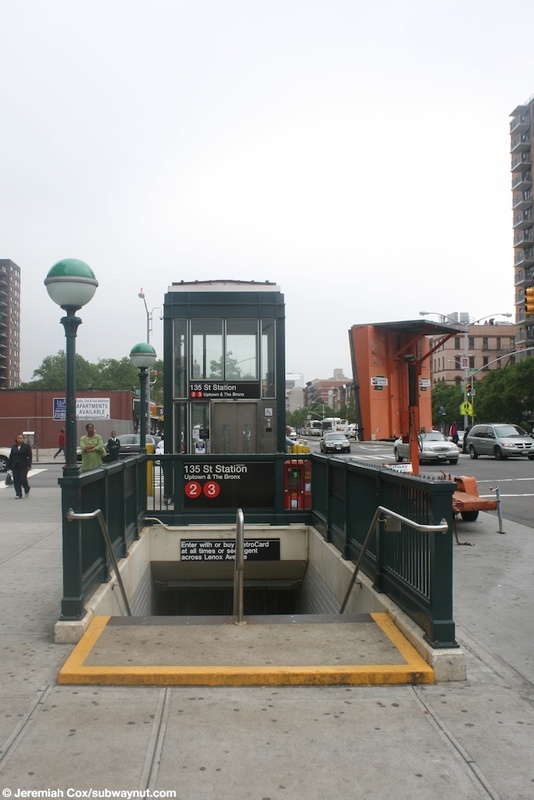 24 May, 2010 (135n210) At street level an uptown & the Bronx Street stair with its elevator behind it. 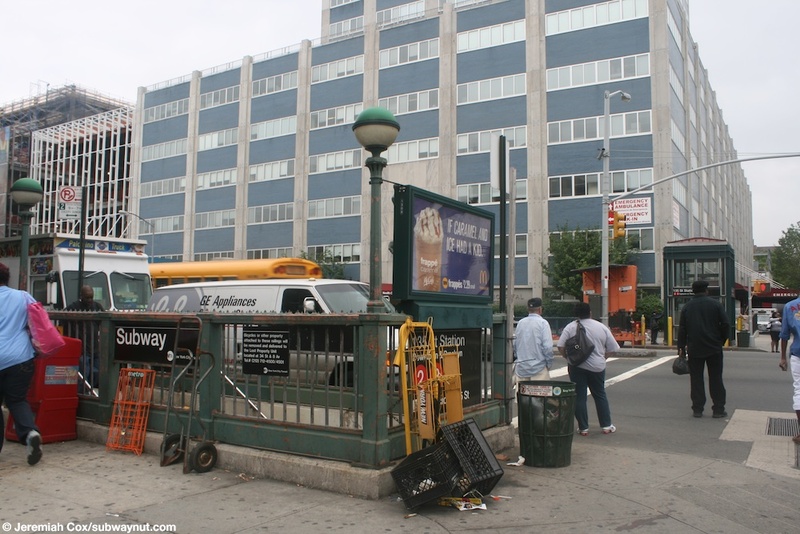 24 May, 2010 (135n211) Looking accross and catty-corner to the uptown and the Bronx elevator is the downtown and Brooklyn one. 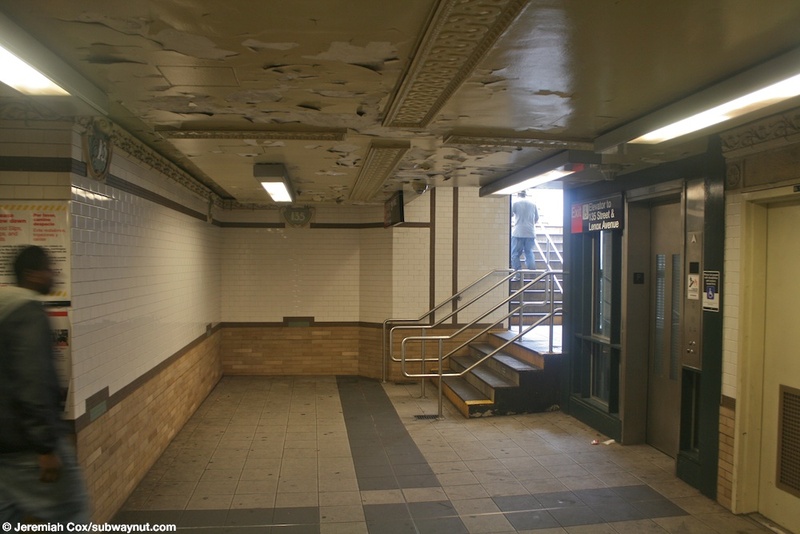 24 May, 2010 (135n212) The other, older and in need of a paint job downtown subway entrance to 135 Street. 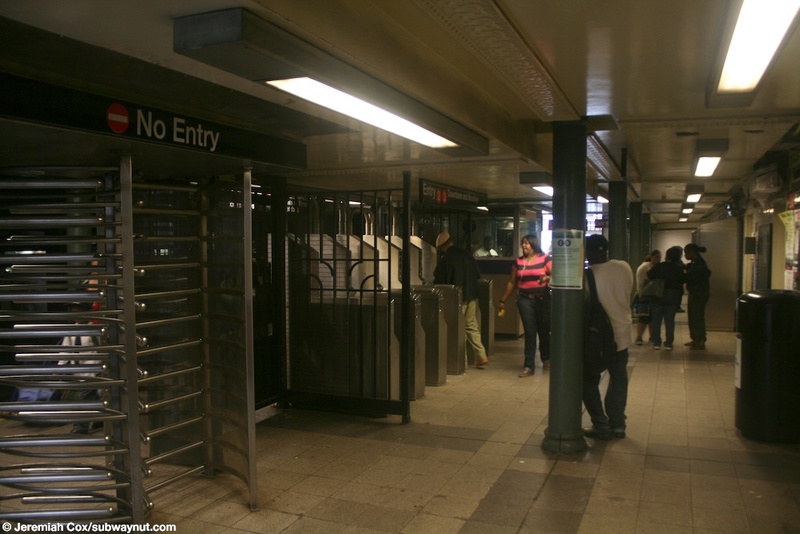 (135n213) The on platform fare control area at 135 Street for downtown trains. 24 May, 2010 (135n214) Still downtown fare control with the small token booth that isn't facing the turnstiles. 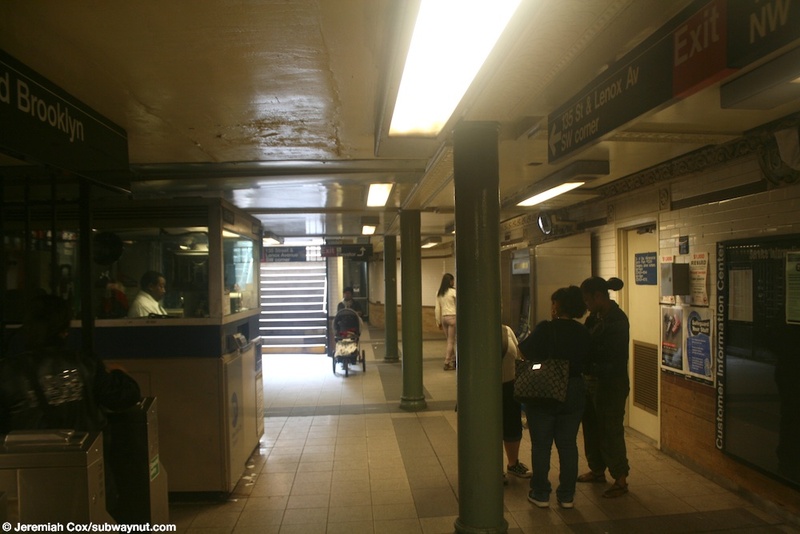 24 May, 2010 (135n215) Looking down the downtown platform at 135 Street.